Raven Tor is a Multi-Period Living History Group which recreates crafts, displays and combat displays from the Bronze Age (c2000BC-800BC) until the Age of Piracy (18th Century). The main areas of historical focus, which revolves around a tented encampment, are the 12th century (Normans/Crusaders/Anarchy), the 15th century (The Wars of the Roses), and the 18th century (Pirates/Smugglers). Demonstrations include armour making, cooking, weaving, leather work, fletching, and period medicine/surgery. In addition, weapons and combat displays are held either as a foot tournament, skirmish or part of a larger scale re-creation of a historical event. With support from other local living history groups, ordinance, musket, and pike can also be demonstrated for 17th century displays. Group members have a wide range of historical interests which allows Raven Tor to portray such a wide range of historical periods. Portrayal of a Roman Gladiatorial School of four Gladiators, Lanister, Doctori, and attendants started in 2010 at Bignor Roman Villa, and Smugglers and Pirate crew of The Mermaid was formalised in 2012. In addition Raven Tor is the host living history group at Arundel Castle in West Sussex. The group provides the castle with a varied events programme from period encampments, a siege, tournaments and medieval joust, as well as family days such as Pirate Days. 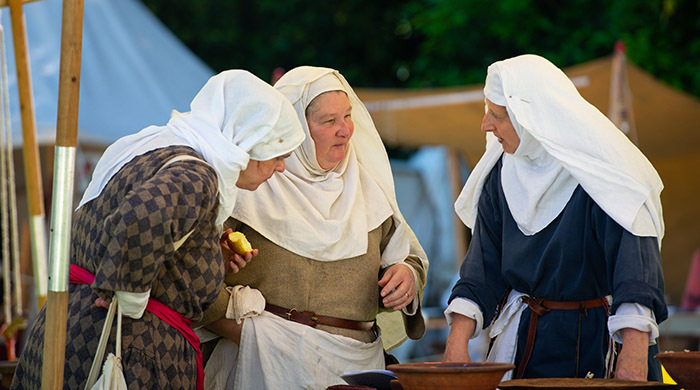 Portraying the FitzAlan Household (15th century Earls of Arundel), group members have attended other events covering The Wars of The Roses, as a fighting unit comprising of Knights, men-at-arms, archers and camp followers. To date members of Raven Tor have undertaken film work for The National Geographic Channel, BBC 4, Channel 4 (Worst Jobs in History) and Meridian, and have undertaken events and displays at the Weald and Downland Open Air Museum, Bignor Roman Villa, English Heritage sites , including Porchester Castle, National Trust sites, including Petworth House, Arundel Castle, and Parham House. Murder Mysteries, walks and talks have also been undertaken at Chichester District Museum, Petworth House and over 30 villages in the Chichester District.